Cricket players around the world sent messages of support to the family of Australian test batsman Phil Hughes who remained in a critical condition in an induced coma Wednesday. 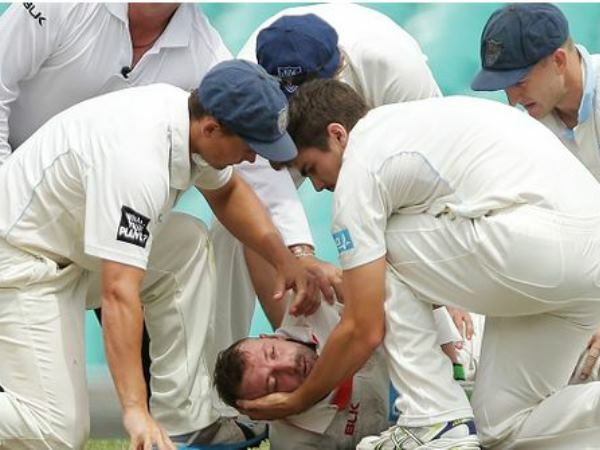 Hughes, 25, collapsed after he was struck in the head by a rising cricket ball during a state match in Sydney on Tuesday. The ball hit him just behind the ear and below his helmet. Cricket Australia team doctor Peter Brukner told reporters outside the hospital Wednesday Hughes' condition had not changed since he underwent emergency surgery on Tuesday. The Indian cricket team which is in Brisbane preparing for next week's start to a Test series against Australia issued a statement extending their best wishes to Hughes and his family. English test cricketers including Stuart Broad, James Anderson and Michael Vaughn sent personal messages of support. Australian test captain Michael Clarke spent most of the day with Hughes' family at his bedside. Friend and player Brad Haddin was seen leaving the hospital in tears. The bowler of the bouncer that struck Hughes, Sean Abbott, cradled Hughes head after he collapsed. They are close friends and past teammates. He is receiving counselling and support from other cricketers. Australia's inter-state cricket competition was called off in the wake of Hughes' injury.